Most leaders recognise that the delivery of a step-change starts best when there is a dramatic event – “a significant emotional event.” The most common events are a change in CEO, a poor financial result or the loss of a significant customer contract. The effective change process is driven by a need-for-change that recognises why the status quo cannot continue. This helps employees accept and commit to the transformation. However this does not need to be driven by a crisis. There is a tendency for leaders to delay a business transformation until a crisis dictates that one is needed. In some ways this is understandable. 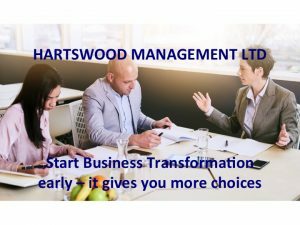 The decision to launch a business transformation is a complex one and it is therefore easier to see what is required and for the whole senior leadership team to reach a common agreement, when the need is obvious to everyone. However in most cases the delay in initiating transformation reduces the options open to the Senior Leadership Team. A late decision often results from poor financial performance and drives the need for a rapid recovery or turnaround. This approach results in a more challenging change environment for the staff and also leads to compromises in the decisions, for example, when cost cutting is needed quickly but critical areas of the organisation become potential targets for reduction when they should be protected. An early decision to initiate a business transformation programme will provide more choices. The senior leadership team to structure the right programme. The staff of the organisation to be engaged by a compelling need-for-change and vision of the future. Implementing a significant improvement based on product range revisions, customer satisfaction enhancements or business process improvements. An early decision to create a business transformation programme creates a positive opportunity to shape the future, whereas a late decision can become a do-or-die initiative. Consider what challenges are faced by your organisation and what options you have for responding early. Read Changing Spots – a systems approach to change management for understanding how a senior leadership team can initiate an improvement programme (see www.changingspots.co.uk).